Pope Francis put agriculture in focus this weekend when he met with a group of managers from the National Confederation of Direct Cultivators. His comments reflected on two main areas, poverty and hunger and protection of the environment. BTW. I love this photo of him from the L’Osservatore Romano. “There is no humanity without the cultivation of the land; there is no good life without the food it produces for the men and women of every continent. Agriculture thus demonstrates its central role”, said Pope Francis this morning, as he received in audience two hundred managers from the National Confederation of Direct Cultivators in the Clementine Hall on the seventh anniversary of its foundation. The name “direct cultivators”, explained the Pontiff, refers to cultivation, “a typically human and fundamental activity. In agricultural work there is, indeed, acceptance of the precious gift of the land that comes from God, but there is also its development through the equally valuable work of men and women, called to respond boldly and creatively to the mandate forever entrusted to mankind, the cultivation and stewardship of the land”. This task, which requires time and energy, constitutes “a true vocation. It deserves to be recognised and suitably valued as such, also in concrete political and economic decisions. This means eliminating the obstacles that penalise such a valuable activity and that often make it appear unattractive to new generations, even though statistics show an increase in the number of students in schools and institutes of agriculture, which leads us to foresee and increase in the numbers of those employed in the agricultural sector. At the same time, it is necessary to pay due attention to the removal of land from agricultural use, to make it available for apparently more lucrative purposes”. Regarding poverty and hunger he said, “Vatican Council II reiterated the common destination of earthly goods, but in reality the dominant economic system excludes many people from their correct use. The absolutism of the rules of the market and a throwaway culture in which waste of food has reached unacceptable proportions, along with other factors, have caused poverty and suffering for many families. Therefore, the system of production and distribution of food needs to be fundamentally re-evaluated. As our grandparents taught us, you do not play with food! Bread forms part of the sacredness of human life, and must not therefore be treated as a mere commodity”. I’m not sure what information Pope Francis looks at when it comes to climate change but from the words I’ve seen him use he does seem to have a real concern for it and what it means to being able to feed everyone, including the poor. I personally think we have plenty of food to feed the world but have not come up with a system to distribute that food to the people who need it. There are too many political, criminal and other factors in the way right now. According to Vatican Radio Pope Francis has confirmed he will be attending the World Meeting of Families in Philadelphia next year. The Holy Father speaking at the beginning of a Colloquium on Complementarity of Man and Woman happening in Rome which was sponsored by the Congregation for the Doctrine of the Faith. It’s official. We have two new Pope Saints in the Catholic Church. Saints John XXIII and John Paul II. May they please pray for us. Pope Francis opened his homily during this morning’s Mass speaking of the wounds Jesus suffered on the cross. Saint John XXIII and Saint John Paul II were not afraid to look upon the wounds of Jesus, to touch his torn hands and his pierced side. They were not ashamed of the flesh of Christ, they were not scandalized by him, by his cross; they did not despise the flesh of their brother (cf. Is 58:7), because they saw Jesus in every person who suffers and struggles. These were two men of courage, filled with the parrhesia of the Holy Spirit, and they bore witness before the Church and the world to God’s goodness and mercy http://www.wildstarplatinums.com. They were priests, and bishops and popes of the twentieth century. They lived through the tragic events of that century, but they were not overwhelmed by them. For them, God was more powerful; faith was more powerful – faith in Jesus Christ the Redeemer of man and the Lord of history; the mercy of God, shown by those five wounds, was more powerful; and more powerful too was the closeness of Mary our Mother. I could not stay awake to watch the ceremony and Mass but you can find lots of information about it online. Here’s the text of Pope Francis’s homily. 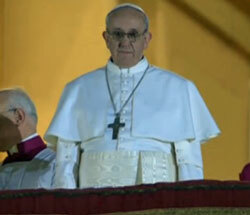 On Sunday Pope Francis closed out the Year of Faith that had been proclaimed by Pope Benedict. It is my hope that many, many people viewed this past year as a journey to come in closer contact with God. Here’s an excerpt from his homily. Today’s solemnity of Our Lord Jesus Christ, King of the Universe, the crowning of the liturgical year, also marks the conclusion of the Year of Faith opened by Pope Benedict XVI, to whom our thoughts now turn with affection and gratitude for this gift which he has given us. By this providential initiative, he gave us an opportunity to rediscover the beauty of the journey of faith begun on the day of our Baptism, which made us children of God and brothers and sisters in the Church. A journey which has as its ultimate end our full encounter with God, and throughout which the Holy Spirit purifies us, lifts us up and sanctifies us, so that we may enter into the happiness for which our hearts long. Let’s look at some ways to follow legitimate news about the selection of our new Pope. I say legitimate because there is so much speculation and supposed news reporting that just shows a world out of touch with faith and especially the Catholic faith. I’m sure the Cardinals really appreciate media stars telling them what they need to consider when making this very important decision, not! We’re seeing it all from advice on how we should have a Pope who is a better business man to a Pope who needs to be more liberal. No where do you see these news stories talk about the need to pray for our Cardinals, that God does watch over His Church, that we need not be afraid and that we need to let our faith guide us during this time. Okay, so how do we follow what is happening in Rome? How about starting with the Vatican News? They are about as close to the action as you can get. And they will have special coverage of the conclave. Then there’s the Pope App. Get it for your iOS or Android device. How’s this for transparency? An app focused on the figure of the Pope. It will allow you to follow his events live and to set up alerts notifying you when papal events begin. It will also give you access to all official papal-related content in a variety of formats: news and official speeches, galleries with the latest images and videos, access to his calendar, and links to other services of the Holy See. Additionally, the app will let you see key areas of the Vatican through webcams distributed throughout St. Peter’s Square that are always broadcasting images. You can also follow Vatican News on Twitter @NewsVa_En, Facebook, YouTube and Flickr. And there is a Vatican Radio app for your iOS or Android devices. And of course there’s always L’OSSERVATORE ROMANO and EWTN. There are so many ways to get better information than you’ll find in the media of today. Now you know what I’ll be following. The title of this book by Pope Benedict XVI, The Joy of Knowing Christ: Meditations on the Gospels, is a wonderful phrase to describe the the feeling that comes from a faith in which you “know Him,” the son of God. It is my first reading of our Pope’s writings and I’m finding him very easy to read and understand. It is my new spiritual reading as suggested by my new spiritual director. I haven’t mentioned Fr. Joseph Callipare, Vicar of Deacon Formation and Permanent Deacons, Diocese of Pensacola/Tallahassee, before. With this year’s move to Florida from Missouri it has meant many changes and one of the most important ones for me is good spiritual direction. I have only been meeting with Fr. Callipare for a couple months but am very happy and blessed to have found him. In my experience of having regular spiritual direction there is no question in my mind that it is a benefit of extreme value to living a holy life in the middle of the world. Having someone who gets to know you personally and whom you receive the sacrament of Confession from on a frequent basis really helps keep you on track, especially is they are firm with you. The help keep you focused on your faith. That’s something we need much more of in today’s society! I wanted to write a post about the lack of respect for each other we see so much in the media and efforts like the mis-guided Occupy Movement. But the Holy Father beat me to the punch and says it so much better than I can. Pope Benedict visited the Major Seminary of Rome for the occasion of the feast of its patroness, Our Lady of Trust. While there he pronounced a “lectio divina” on the passage from the Letter of St. Paul to the Romans in which the Apostle invites the faithful not to conform to this world but to transform themselves and renew their minds in order to discern the will of God, “the good and acceptable and perfect”. “We can reflect upon the Church today”, he said in his off-the-cuff remarks. “There is much talk about the Church of Rome, many things are said. Let us hope that people also talk about our faith. Let us pray to God that it may be so”. The Pope then went on to refer to the force of evil which, in today’s world, also emerges “in two great powers which are good and useful in themselves but easily open to abuse: the power of finance and the power of the media. Both are necessary, both are useful, but so subject to misuse that they often go against their true goals”. Today “we see how the world of finance can dominate mankind. Possession and appearance dominate and enslave the world. … Finance is no longer a tool to promote well being and to support the life of man, but a force that oppresses him, one which almost has to be worshipped”. The Pontiff called on his audience not to conform to this power. “Be non conformists. What counts is not possession but existence”, he said. Christians must not bow to this power, but use it as “as a means, with the freedom of the children of God”. Turning then to consider the question of public opinion, Benedict XVI highlighted how “we have a great need of information, knowledge about the truth of the world; but there is a power of appearance which in the end counts even more than reality itself”. Appearance “overlies the truth and becomes more important. Man no longer pursues the truth but wants above all to appear”. Here too “there is a Christian non conformism. … We want not appearance but truth, and this will give us true freedom”. “Christian non conformism redeems us and restores us to truth. Let us pray to the Lord that He may help us to be free in this non conformism, which is not against the world but is authentic love for the world”. From the press office of the Holy See a notice was just made about some great resources made public in advance of the beatification of John Paul II. “In view of the beatification of John Paul II on 1 May 2011, Vatican Radio and the Vatican Television Centre (CTV) have organised a number of initiatives and made a wide range of documentary material available. “A new page dedicated to John Paul II for his beatification has been activated on Youtube. The page is available at the following address: http://www.youtube.com/giovannipaoloii and includes video clips on the pontificate year by year, as well as video clips with the Pope’s voice in various languages and situations (on trips and in the Vatican). “These are audio recordings supplied and selected by the language programmes of Vatican Radio, which have then been mounted onto video by CTV. The audio of the Pope will be in the original language in which it was pronounced, with English-language subtitles indicating the place (country), day, month and year of the event. “The dedicated Youtube page – as well as the normal channel which has existed for some time in four languages www.youtube.com/vatican – will be supplied with video clips of current events and information concerning the days of the beatification. “A new page has also been activated on Facebook concerning John Paul II in view of his beatification. It may be consulted at this address: www.facebook.com/vatican.johnpaul2. All the video clips uploaded to the Youtube channel will be available at the same time on this page. Here’s the video for the year 2001 which was when I and my family got to personally meet the Holy Father in Rome. According to an AP story in the Washington Post, Pope Benedict would like a solar powered popemobile. It’s nice to see a story about our Pope that doesn’t criticize him! Anyone have a fast, solar-powered electric popemobile for his holiness? The Vatican says Pope Benedict XVI would gladly use one as another sign of his efforts to promote sustainable energy and take care of the planet, but one has yet to be offered. Pope Benedict calls agriculture an “indispensable resource for the future” that is not given enough importance today. Something to think about this week as we “give our thanks to God for the fruits of the earth and the work of man.” Amen! It looks like you have options if you want to watch live coverage of Pope Benedict’s visit to the United Kingdom. His trip will end with the Beatification of Cardinal John Henry Newman. For starters EWTN will be covering it live. It also looks like there will be live broadcasts from the Vatican Television Center. Then it looks like the Catholic Communications Network will be live streaming as well. They’ve got a blog started. You can also follow them on Facebook, Twitter and Flickr. 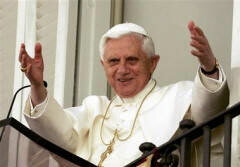 The Knights of Columbus is urging all Knights to say a novena in support of our Pope Benedict. You can learn more about it on the national Knights website. 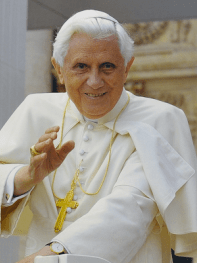 All Knights of Columbus are encouraged to join in a special novena for Pope Benedict XVI, beginning Divine Mercy Sunday, April 11, and concluding Monday, April 19, the fifth anniversary of the Holy Father’s election in 2005. We pray for the pope and for his pastoral mission, asking God to protect, strengthen and uplift our beloved Holy Father at this time of considerable challenge. This is the image and prayer from the prayer card they have created (pdf). Lord, source of eternal life and truth, give to your shepherd, Benedict, a spirit of courage and right judgment, a spirit of knowledge and love. By governing with fidelity those entrusted to his care, may he, as successor to the Apostle Peter and Vicar of Christ, build your Church into a sacrament of unity, love and peace for all the world. Amen. V/	Let us pray for Benedict, the pope. R/	May the Lord preserve him, give him a long life, make him blessed upon the earth, and not hand him over to the power of his enemies. V/	May your hand be upon your holy servant. R/ And upon your son, whom you have anointed. As we’re entering Holy Week, it’s a really good time to pray for our Pope and the Church. There is much being said in the news about how abuses by some priests have been handled and it’s obvious that the Church is under attack because of their actions. There is no excuse for what those have done. It has caused great harm to individuals and the Church. We’re seeing news reports that are speculating (is that news?) on whether the Pope should resign and polls of what people think about this or that. One I just saw from the N.Y. Times is titled, “At the Vatican, Up Against the World.” Just the title ought to tell you something. I would challenge all the people who are so up in arms about what a very small element of Church personnel have done to put their effort into prayer and look first at their own actions before casting stones. If we had more people spending their time in prayer maybe we wouldn’t have these problems. Our faith is a supernatural virtue that allows us to believe what God has revealed. The world is and always will be at odds with that. My faith is not dependent on polls or public opinion. There are still truths of our faith that can not be changed just because someone wants them to. I’ve seen nothing factual in the news to weaken my faith. It hurts to know what some have done but I can only pity them and pray for them and I will continue to do so.